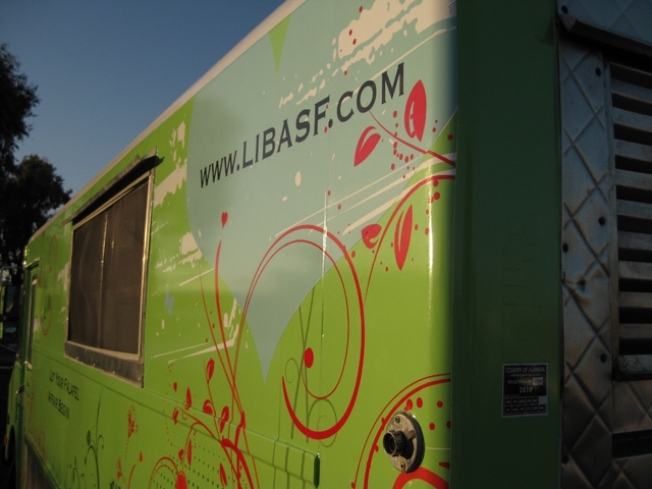 Liba's falafel truck made its debut Monday. News about Liba's truck stop on the corner of DeHaro and Alameda streets in San Francisco came out a few weeks back, and as noted by SF Weekly, Monday marks the falafel truck's formal San Francisco debut. The menu consists of Middle Eastern classics such as hummus and falafel and a variety of non-traditional foods such as sweet potato fries and bundt cakes. It will join the myriad of converted taco trucks and push carts patrolling San Francisco streets with food. The difference here is that Liba's actually has a permit from the City allowing it to operate legally. So you don't have to worry about grabbing your food and running or following a twitterfeed to find out where the truck will be next and for how long. The falafel loving foodie behind the truck will be making regular stops in the area between 11a.m. to 2 p.m. on Mondays, Wednesdays and Fridays. Ahlin wa sahlin.